March 23, 2019 at 1:35 pm. In 2016, a small protest encampment at the Standing Rock reservation in North Dakota, initially established to block construction of the Dakota Access oil pipeline, grew to be the largest Indigenous protest movement in the twenty-first century, attracting tens of thousands of Indigenous and non-Native allies from around the world. Its slogan – “Mni Wiconi” – Water is Life – was about more than just a pipeline. Water protectors knew this battle for Native sovereignty had already been fought many times before, and that even after the encampment was gone their anti-colonial struggle would continue. In Our History is the Future, Nick Estes traces traditions of Indigenous resistance from the days of the Missouri River trading forts through the Indian Wars, the Pick-Sloan Dams, the American Indian Movement and the campaign for Indigenous Rights at the United Nations. While a historian by trade, Estes also draws on personal observations from the encampments and from his own growing up as a citizen of Oceti Sakowin (the Nation of the Seven Council Fires), making this book a work of authentic history, a personal story, and a stirring manifesto for native liberation. 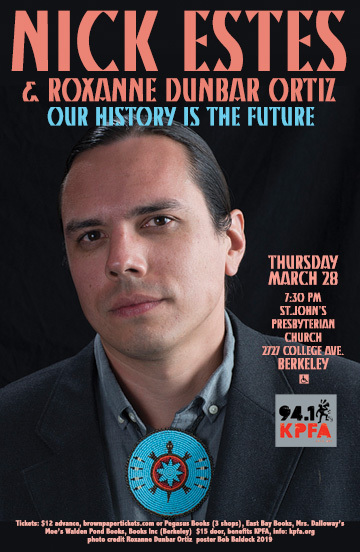 Nick Estes, a citizen of the Lower Brule Sioux Tribe, is an Assistant Professor of American Studies at the University of New Mexico, and a co-founder of The Red Nation, an organization dedicated to native liberation. Roxanne Dunbar-Ortiz grew up in rural Oklahoma, the daughter of a tenant farmer and part-Indian mother. She is the author of many books, including Outlaw Woman, a memoir of her time in an armed underground group, Red Dirt: Growing up Okie, and Blood On the Border: A Memoir of the Contra War,and the recent, widely acclaimed An Indigenous People’s History of the United States.